The legacy of the 95 years of Nelson Mandela’s powerful life is a historical library. This year will be rich with remembrance. By Sahm Venter and Verne Harris for the NELSON MANDELA FOUNDATION. And suddenly Nelson Mandela was back among us. A few hours earlier, on his 10,053rd day in custody, he sat in his last jail, a house in the grounds of Victor Verster Prison, and quietly went through the speech he was to make to the world from the balcony of Cape Town’s City Hall. The man whose words and image the South African regime had forbidden its people from seeing was free at last. Twenty-seven years, six months and six days after he was arrested on a lonely country road on the afternoon of Sunday 5 August 1962, he was back among us. His belongings – mainly books and papers – were packed up in 22 cardboard boxes and transported in a convoy of hastily borrowed sedan cars. Included among them were a body board, mistakenly noted as a “surfboard” he could use when using the swimming pool next to the house, and an exercise bicycle for this fitness fanatic. As on the day he was taken into custody, his release on 11 February 1990 was a Sunday, again on a country road. But when he walked into freedom at 16:22, there was nothing lonely or quiet about the moment. Hundreds of cheering people were there to witness the occasion, and scores more lined his route into Cape Town. South Africa would never be the same again. The Nelson Mandela Foundation he would set up nine years later promotes his legacy through archival work, research and dialogue. One of the many discoveries we have made is that his own autobiography, Long Walk to Freedom, contains several errors of fact, including that in the chaos of his release he was not taken to the home of his lawyer Dullah Omar, but to the home of activist Saleem Mowzer. This was corrected in the sequel Dare Not Linger, published in 2017. Mandela’s first speech in almost three decades signalled the path of servant leadership, peace and reconciliation that he was to make the hallmark of the remaining years of his life. As it turned out, he was free for just 22 years, nine months and 24 days before passing away at his home in Johannesburg on 5 December 2013. Shortly after his release from prison, he led talks between his African National Congress and the ruling National Party. These historic discussions culminated in the Groote Schuur Minute in May 1990, the Pretoria Minute in August 1990 and the DF Malan Accord in February 1991 and led, in December 1991, to the negotiations to end white minority rule in South Africa. While we commemorate 2018 as the centenary of the birth of this great South African on 18 July 1918, he has left us with rich layers of milestones in his remarkable life. June 2018 marks the 25th anniversary of the end of the multiparty talks which resulted in an agreed date for South Africa’s first democratic elections. May is the 24th anniversary of Nelson Mandela being inaugurated as our country’s first president elected by the majority of South Africans. June is the 19th anniversary of his stepping down after serving one term as president. October is the 25th anniversary of the announcement that Mandela and President FW de Klerk would be awarded the Nobel Peace Prize for their efforts to bring about peace in South Africa. 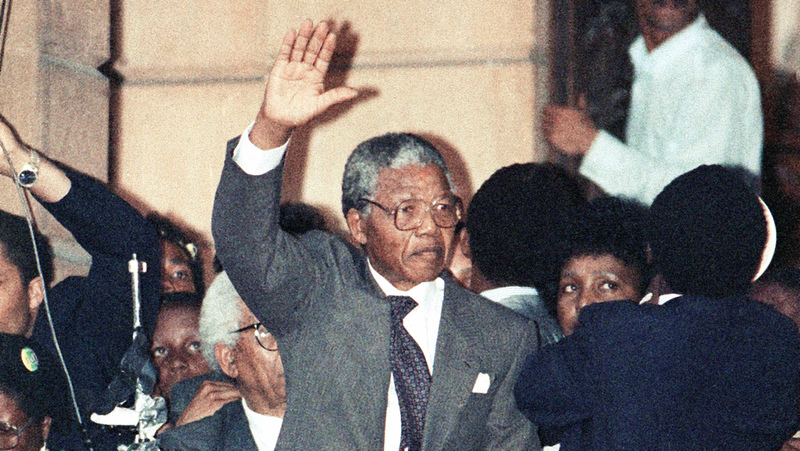 Photo: Nelson Mandela in Cape Town, 11 February 1990.